If you read just one Sci Fi Fantasy this year, make it In the Dark Spaces. It took my breath away on so many levels. Not only was I immersed in a new world where terrifying alien invaders become wise philosophers, I was also forced to face unimaginable questions. What would I be prepared to live for? What would I die for without hesitation? What would you do if you were stolen from the only world you knew and the one reason that might keep you clinging to life was left behind? A girl in her early teens watches as everyone in her home is murdered en masse. Then she faces an on the spot decision : blend in with the invaders or die. She chooses to blend in. With a missing baby cousin as her only motivation to keep going, she does things she would never normally sanction. She carries guilt so heavy she can barely move beneath it and finally she has to face the truth. Her allegiances have changed. At first I thought In the Dark Spaces was a thriller, then I was convinced it was a tale of survival. After a while I decided it was a saga of loyalty. In truth, it's all of these and so much more. No wonder Cally Black won the Ampersand Prize with this genre-smashing hostage drama. Cally is a master story-teller. She plays with your heart and your mind and weaves a net you won't want to escape: all in a good way. 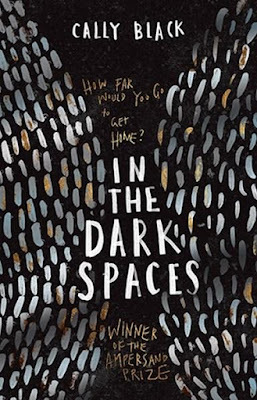 Buckle up and be prepared to lose a few hours on the In the Dark Spaces rollercoaster. It will leave you hungry for more.